A potential design for the terminal's interior. Rendering courtesy of the Allegheny County Airport Authority. What will it be like to fly out of Pittsburgh in 2020? With partners signed on, designs to be unveiled soon and construction set to break ground before the end of the year, the new landside terminal at Pittsburgh International Airport is shaping up to be one of the region’s most significant development projects of 2019. 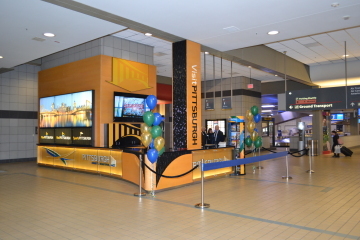 Last Friday, the Allegheny County Airport Authority announced that the Pittsburgh-based engineering and consulting firm Michael Baker International has been awarded an $8 million contract to assist in the airport’s Terminal Modernization Program. The company, which has collaborated on the construction of solar panel fields in California and at Las Vegas City Hall, will join the architecture firms Gensler, HDR and Luis Vidal + Architects in the project. First announced in 2017, the Terminal Modernization Program is an ambitious redevelopment effort that will see the existing landside terminal demolished, and the current airside terminal remodeled into 51 gates. While the existing airport design was optimized for an era when the airport was a bustling hub for US Airways, Airport Authority CEO Christina Cassotis says the new design will emphasize a variety of carriers large and small. Altogether, the project is slated to cost $1.1 billion and is expected to result in $1.66 billion in economic activity, according to the Airport Authority. It will also create 10,642 direct and indirect jobs, and $28 million and state and local income tax, according to the Airport Authority. The budget does not include any local tax dollars, and will be financed through bonds, revenue from gas drilling, parking and retail. Design plans for the new terminal will be unveiled on Feb. 20th. Stay tuned to NEXTpittsburgh for more details.